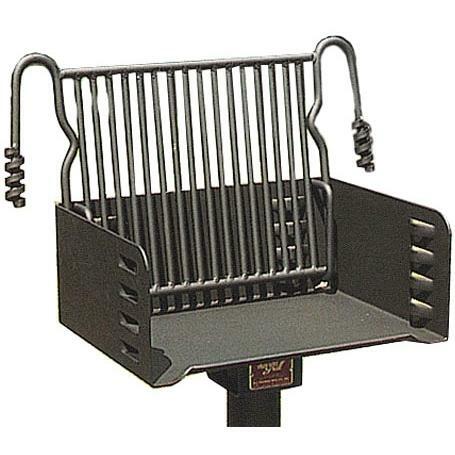 This BBQ Charcoal grill features four level adjustable cooking grate. Reinforced grate is virtually indestructible. Cooking Grate tips back out of grill firebox yet remains attached, for easier fire building and clean out. Firebox is ring and flange reinforced. Theft-deterrent base attachment. Entire park grill is made from Carbon Steel and finished with high temp non-toxic black enamel paint. 300 square inches cooking area. Firebox dimensions: 15 l x 20 w x 8 high. Must be mounted in concrete. Base is 40 long by 3. 5 in diameter.